Lineage: There were three units of the British Army known as the 21st Light Dragoons which were raised and disbanded between 1760 and 1820. The 21st (Empress of India’s) Lancers traced its origins to the 3rd Bengal European Light Cavalry which was formed in 1858 by East India Company. Following the dissolution of the East India Company in 1858, in consequence of the Indian Mutiny, the British government took control of its military units. In 1862, the Regiment became the 21st Light Dragoons and subsequently the 21st Hussars later in the same year. The Regiment was redesignated as 21st Lancers in 1897 and the 21st (Empress of India’s) Lancers in 1898. Then the 21st Lancers (Empress of India’s) in 1921 before the Regiment was amalgamated with the 17th Lancers to form the 17th/21st Lancers in 1922. Location in August 1914: The 21st (Empress of India’s) Lancers was stationed at Rawalpindi (Punjab, Pakistan) and was recorded as being under orders for Risalpur (Khyber-Pakhtunkhwa, Pakistan) in the October 1914 Indian Army List. The Regiment arrived in India from Egypt on 10 October 1912. The 21st (Empress of India’s) Lancers, usually abbreviated to the 21st Lancers, was a British cavalry regiment which served in India for the duration of the First World War. The Regiment had achieved widespread fame in 1898 for a charge at the Battle of Omdurman which saw the award of three Victoria Crosses. Winston Churchill also took part. The 21st Lancers also made a charge, though now largely forgotten, at the Battle of Shabkadar on 5 September 1915. On the outbreak of war in August 1914, the 21st (Empress of India’s) Lancers was serving as part of the 1st (Risalpur) Cavalry Brigade in the 1st (Peshawar) Division at Rawalpindi in what is now in Pakistan. The Regiment moved to Risalpur, a town on what was then the North West Frontier of India, shortly afterwards. The withdrawal of large numbers of British and Indian units had led to unrest among the tribes of the frontier. One of the most serious pieces of unrest occurred in 1915 when Mohmand tribesmen (a Pathan tribe) began to gather in strength near the city of Peshawar. A Jihad (Holy War) was declared and a series of small skirmishes took place before the Battle of Shabkadar was fought by a Moveable Column on 5 September 1915. On the 28 August 1915, B and C squadrons (only half of the 21st Lancers was present at the battle) rode from Risalpur to Shabkadar Fort, 15 km (9.3 miles) from Peshawar. On the 4 September 1915, an estimated 2,500 Mohmand tribesman were seen on the hills outlying Shabkadar. The next day an assault was ordered in what would be the largest battle fought on the North West Frontier since 1897. During the battle, a Mohmand force used a sand ridge as cover to occupy a village which threatened the British artillery. Two squadrons of the 21st (Empress of India’s) Lancers were ordered to clear the village. 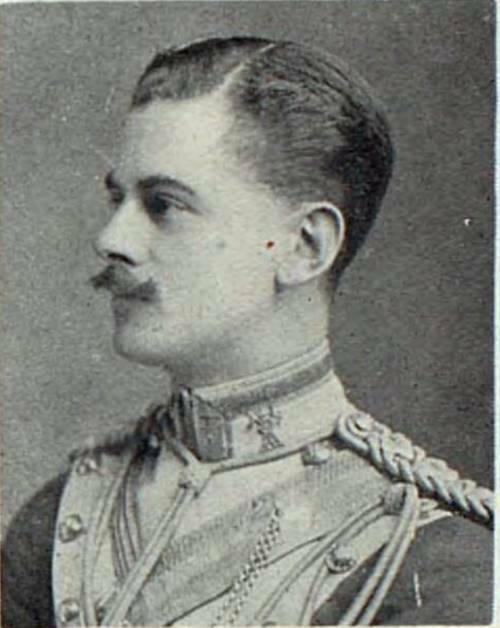 C Squadron, led by the Commanding Officer, Lieutenant-Colonel John Barclay Scriven met disaster when it ran into a hidden nullah (watercourse) fourteen feet wide and six feet deep. The Squadron was completely disorganized with many struggling in the nullah while others continued on to attack the village. However, it was at this moment of chaos that the Mohmands attacked out of the surrounding maize fields. For most conspicuous bravery. When under close fire of the enemy, who were within a few yards, he rescued Captain G. E. D. Learoyd, whose horse had been shot, by taking him up behind him and galloping into safety. Shoeing-Smith Hull acted entirely on his own initiative, and saved his officer’s life at the imminent risk of his own. C and B Squadrons were ordered to ——- as all the tribes are out and were coming down from the hills. It is the biggest expedition known since 1897. The other day we went into action, and it was not long before the bullets were flying about us. We were holding a hill when one of our officers was shot through the chest, but he is going on all right now. We had to retire from the hill, and then came the order to form line and charge, as the enemy were getting all round us. So we charged, but the ground was awful. We lost our Colonel and Squadron Leader and six men in the charge, and had about 16 wounded. There were thousands of the enemy. The enemy hid themselves in the river over which we charged. All one could see were horses falling down shot, and men falling off them either wounded or dead. I killed two of the enemy with my sword. When we rallied we found all our wounded had been dragged away by the enemy to the hill. We sent out a search party of native infantry, and they brought in the dead. Yesterday we went out and raided all the native villages after the artillery had shelled them with their guns. The enemy have been so frightened that they have gone to the hills to bury their dead, who we think number about 6,000. All of them have got rifles: some of them are elephant guns, but I think the old Kaiser has got something to do with it. The General says out charge was like riding into a death trap, but we save two British infantry regiments from being cut up, and we are being praised for what we did. The 21st (Empress of India’s) Lancers remained in India for the duration of the war, though a service squadron composed of reservists served with XIV Corps in France. 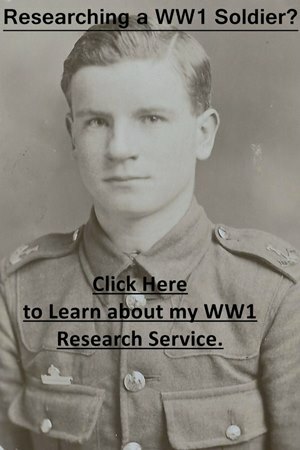 If you are researching a soldier who served in the First World War I would suggest starting by looking at my WW1 Research Guides. The 21st Lancers is a difficult regiment to research compared to other British cavalry regiments as they left few records to consult. There is no war diary for the regiment which makes it hard to add detail to a soldier’s service in India. However, there is a variety of information concerning the Regiment and the men who served with it in contemporary newspapers. There is a short chapter on the Regiment’s activities in India with some great photographs in The Last Charge: The 21st Lancers and the Battle of Omdurman by Terry A. Brighton. Officers: You should look for a service record at the National Archives but if they continued to serve past April 1922 then their record will be with the Ministry of Defence. I offer a copying service for officers’ files at the National Archives. The Regiment suffered the following officer casualties at the Battle of Shabkadar. Killed: Anderson, Capt. P. H. A., Scriven, Lt-Col. J. B., Thompson, Lt. N. R. Wounded: Horsley, Capt. C. D., Kekewich, Lt. S., Maybery, Lt. R. A. This portrait of Captain Percy Hume Allfrey Anderson who was killed at Percy Hume Allfrey Anderson 21st Lancers was published in The Sphere, 16 October 1915. Other Ranks: Start your search by looking for a service record and medal index card. If a soldier served past January 1921 then their record will still be held by the Ministry of Defence. For other rank casualties at the Battle of Shabkadar, The Times casualty list should be consulted. 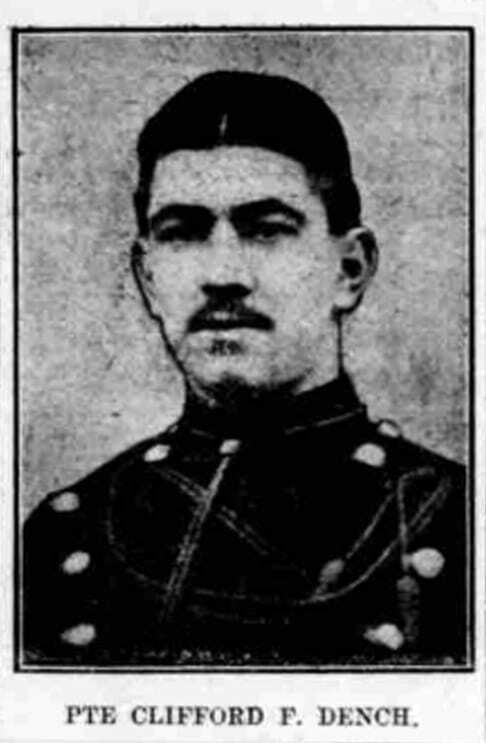 This photograph of Clifford Dench was published in the Surrey Mirror and County Post, 8 October 1915 along with Dench’s account of the Battle of Shabkadar. The British newspaper archive which is available on FindmyPast is a fantastic resource not only to research a soldier but also a unit during the war. If you’re researching a soldier who served in the First World War, then you’ll need to search the records on Ancestry and FindmyPast. Both sites offer free trials and if you’re in Britain, then you can usually access them for free at your local library. Clicking on the banner below will take you to FindmyPast. There are no war diaries concerning the Regiment’s activities in India. However, there is a war diary for the service squadron which joined XIV Corps in France in 1916. This can be downloaded for a small fee by clicking the blue link below. Notes A good war diary which covers the 1st Service Squadron, 21st Lancers on the Western Front and 2nd King Edward’s Horse and has been digitized and is available to download from the National Archives’ website. I have transcribed a few entries below. Unfortunately, there is no regimental history for the 21st Lancers covering its service during the First World War. There is a short chapter concerning the 21st Lancers in India in The Last Charge: The 21st Lancers and the Battle of Omdurman by Terry A. Brighton. This book has some great photos of the 21st (Empress of India’s) Lancers in India. 21 July 1916: Proven: Rainy. To riding horses evacuated mobile section. A draft of 50 Non-commissioned officers and men arrived for duty from No.5 General Base, and 25 Non-commissioned officers and men arrived for duty with the 1st Service Squadron 21st Lancers. 8 October 1916: Etinehem Road: 1623 Private Shaw 2nd K.E.H. wounded and sent to Hospital. Four lancers and three K.E.H. evacuated to Base Hospital sick. 1 November 1916: Etinehem Road: 4387 Sergt Watkins C and 8241 Sergt Day 21st Lancers evacuated to Base and struck off strength 31 October 1916. 6709 Sergt Harris F. F. 9th Lancers joined 21st Lancers for duty 30 October 1916. 16 November 1916: Etinehem Road: 6374 S.S.M. Ware 21st Lancers, was transferred to the North Somerset Yeomanry and struck off strength. 2 December 1916: 2nd Lieutenant H. H. Kilby 1st Service Squadron 21st Lancers transferred to Royal Flying Corps struck off strength 1 December 1916. 25 December 1916: Etineham Road: Christmas Day. A liberal commissariat had been arranged from Paris for the men in Camp, and well-filled hampers were sent round to the eighteen distant detached posts which the Regiment was holding. A very pleasant quiet day with little rain. The following telegram was received from the Commander in Chief “I desire to convey to all ranks under my command my hearty good wishes for Christmas and the New Year. It is indeed a privilege to command such officers and such men, and I fell confident that the magnificent qualities they have shown in the face of the enemy will carry our armies to ultimate victory”.